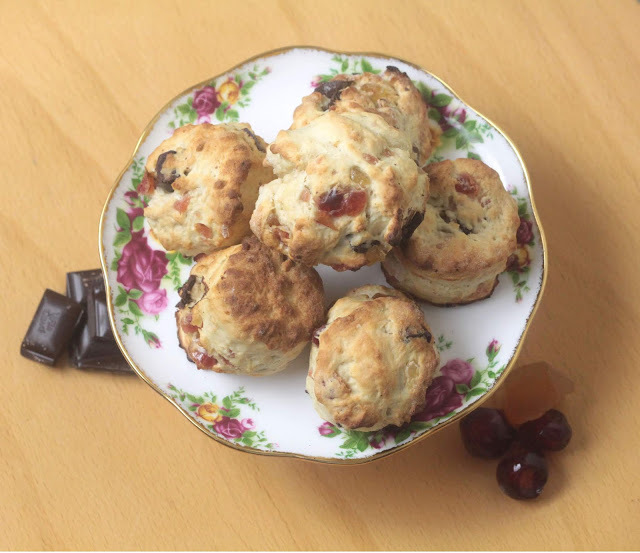 These cherry, chocolate and ginger scones aren't you usual type of scone. They are packed full with flavour. Whilst my husband insisted on putting butter on his, it really isn't required. I made them small in a hope that I wouldn't eat too many. Yeah that didn't work! They are very moreish! They are really easy to make and I based the scone recipe on this one from Delia. The stem ginger gives them a really grown up taste, but I leave this out on the ones for the children. Weigh out the flour, salt and Stork and rub together. Slowly add the milk, forming a dough. Mix in the.chocolate, ginger and cherries. Add a little more flour if it is sticky. Flatten to about 3cm and use an inch diameter cookie cutter to press out the scones. Bake for around 9 minutes when they look golden brown. 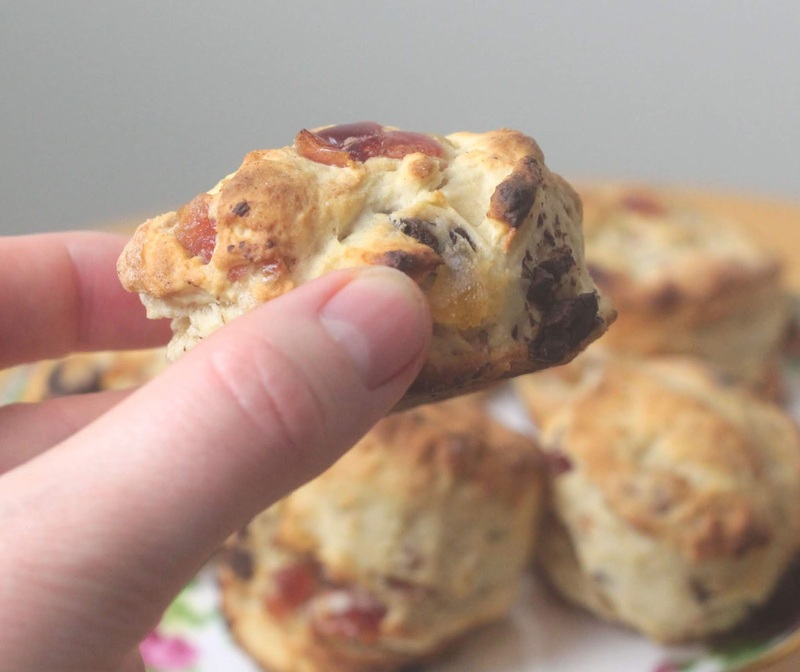 Are you a fan of flavoured scones or is it plain with jam and cream that you like best? Wow, what an exciting flavour combination, I would never have thought of adding all these delicious flavours to one scone mix..defo need to try these. What a great flavour combination! I don't think I've ever thought to put ginger in scones before but I can see it would go beautifully with the cherries. 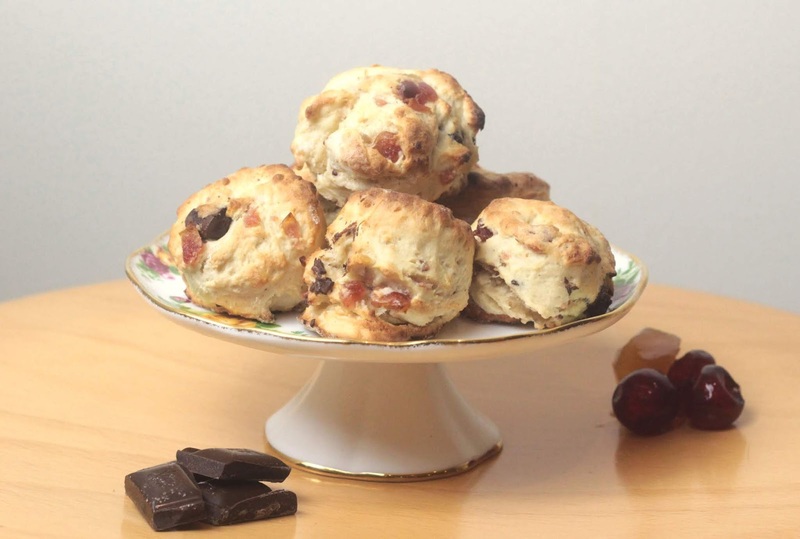 Scones are a great bake at anytime, I have had cherry and chcolate in a scone before but i bet the ginger is a nice additon. I do love flavoured scones! There are so many different combinations but I just don't think people experiment enough with them!